Seeding perennial forage species such as alfalfa during the late summer in Wisconsin can result in vigorous and productive stands when proper establishment practices are followed. Late summer alfalfa seeding does not replace traditional spring-seeding recommendations, but rather provides growers with an establishment alternative when crop rotation allows. Like most crop production practices, success is achieved with management and attention to details. This Focus on Forage will discuss the opportunities, advantages, risks and management practices needed for successful late summer alfalfa establishment. Several opportunities exist in Wisconsin crop rotations where growers can seed alfalfa during the late summer. First, when a small grain or vegetable crop is grown and harvest occurs before or during early August, growers may consider seeding alfalfa immediately after harvest. It is important to make sure that herbicide carryover from the previous crop will not prevent alfalfa seedling establishment. This may especially be a problem where alfalfa seedings follow a sweet corn crop. A second circumstance where growers may consider late summer alfalfa establishment is when a spring seeding has failed. Disease buildup or allelopathic effects are generally not of concern in this situation because alfalfa plants did not have time to become fully established. There have been confirmed reports of fields that were successfully established during the late summer of the year when a spring-seeded alfalfa stand failed due to Pythium, Aphanomyces, or Phytophthora root rots. Often forage producers can determine in early spring that an established stand will no longer be productive, and alternative acres for additional spring seedings are limited by such factors as previous herbicide use. In these situations, the fastest and least risky alternative to get a nonproductive field back into alfalfa would be to plow and seed the field to a small grain crop for silage or grain harvest and then establish alfalfa later in the summer. This option minimizes the risk of allelopathy or disease problems. What are the advantages of seeding alfalfa in late summer? Late summer alfalfa establishment offers several advantages over traditional spring seedings. Weed and insect pests seldom limit stand establishment success. Using a pre-plant incorporated herbicide or a companion crop is not recommended. Companion crops will compete too strongly with the developing alfalfa seedlings for moisture. Also, the first hard freeze will kill any annual weeds that may have germinated. Remember that soil temperatures are much higher in the late summer than they are in the early spring. With adequate moisture, alfalfa seedlings will germinate, grow and develop a crop canopy at a much faster rate. Alfalfa yields of late summer seedings during the first production year are generally higher than yields of spring seedings during the establishment year. In fact, yields are often comparable to 2- and 3-year-old stands. By seeding alfalfa during the late summer, forage producers can have the equivalent of an established stand the following spring. Additionally, springtime workload is reduced. Late summer alfalfa establishment may offer the most advantage to producers with heavy, poorly drained soils. It is on these types of soils where seedling diseases such as Pythium, Phytophthora root rot, and Aphanomyces root rot often limit alfalfa establishment in the spring. Because the soil is both warmer and dryer during the late summer, these diseases are much less of a concern. What are the risks of seeding alfalfa in late summer? There are also risks associated with late summer alfalfa establishment. The primary concern is the possibility of moisture stress during germination and seedling establishment. Timely seeding will reduce this risk significantly. It’s always advisable to make late summer seeding decisions based upon current soil moisture conditions and short-term weather forecasts. Near normal August and September rainfall should be more than adequate to establish vigorous and productive stands. Another risk is the threat of an early killing frost and/or severe winter. Again, timely seeding is important to minimize these risks. What are the recommended seeding and establishment practices for late summer seedings? **Note that throughout this text reference has been made to seeding date as late summer, NOT FALL! Although weather and soil conditions vary each year, it is recommended that late summer seedings be made between August 1st and August 15th in Wisconsin. If you are in the northern half of the state, plant alfalfa in the early part of August. If soil moisture and temperature conditions allow, seeding slightly earlier or later than these dates will also result in successful alfalfa establishment. As a rule of thumb, seed alfalfa 6-8 weeks before the average first killing frost in your area. Seeding too early increases the risk for hot, dry conditions to occur during germination and seedling development. Seeding too late will not give the plants enough time to develop adequate root and top growth before winter. After September 1st, your chances of successfully establishing alfalfa are very low. Researchers at Purdue University (at a location much farther south than Wisconsin) reported that September 6 and 20 seeding dates in 1984 and 1985 resulted in significant winterkill and/or a high influx of weeds into alfalfa stands the following spring. In northern Pennsylvania, alfalfa yield in the first production year were reduced by 158 lbs/acre for each day seeding was delayed after August 1st. Soil fertility requirements for late summer-seeded alfalfa are the same as spring seedings. Take a soil test during the fall prior to the establishment year and follow recommendations for correcting soil pH, phosphorus, and potassium deficiencies. The UW- Extension bulletin A2809 (Nutrient Application Guidelines for Field, Vegetable, and Fruit Crops in Wisconsin) provides specific soil fertility recommendations for growing alfalfa. Minimize the amount of tillage immediately before late summer seedings to avoid unnecessary soil moisture loss. Perform secondary tillage operations that provide a good seedbed for the type of seeding equipment being used. Not enough credit is given to the importance of firm seedbeds in successful alfalfa establishment. This is especially true for late summer seedings. A loose, fluffy seedbed in August can severely reduce germination success. 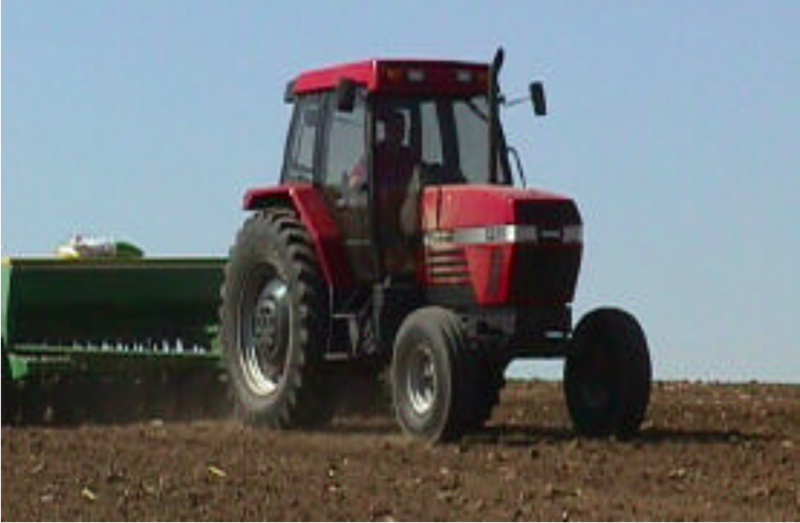 A firm seedbed improves seed-soil contact and maintains more favorable soil moisture conditions. In many situations, one pass with a roller seeder may not be sufficient. A second trip at an angle to seeding with an empty seeder, pulvi-mulcher (tines up), or cultipacker will often make the difference between stand success and failure. On coarse, sandy soils, a firming operation may be needed prior to seeding. No-till late summer forage establishment can be successful if proper seeding equipment is used and seedling competition from weeds is eliminated using an approved herbicide. A 3-year study in Manitowoc County, showed that moldboard plowing was more effective than disking as a primary tillage operation for eliminating volunteer cereal competition in late summer seedings following winter wheat. Generally, no adjustment is needed from recommended spring seeding rates. A seeding rate of 12-15 pounds per acre at a depth of 1⁄4 to 1⁄2 inch is recommended. Controlling weeds is generally not a concern with late summer-seeded alfalfa. Annual broadleaf weeds such as velvetleaf or pigweed usually do not grow very tall and will be killed by the first frost. Occasionally, winter annual broadleaves like shepherd’s purse or field pennycress can be severe. If this is the situation, a post-emergence herbicide application of Pursuit or Buctril will control these weeds. Severe infestations of grassy weeds can be a concern in late summer-seeded alfalfa because of the over winter smothering effect they have on young alfalfa seedlings. In these situations, an application of Poast Plus or Select herbicide (with the appropriate additives) is an effective control measure. Make applications to volunteer winter wheat when the wheat plants are 4 to 6 inches tall and actively growing. Don’t wait until spring to treat winter cereals because control will be much less effective. Whether no-till or conventional till, perennials such as quackgrass need to be controlled before seeding alfalfa. A glyphosate product can be applied when quackgrass is 6 to 8 inches tall and actively growing. When should late summer seeded alfalfa be harvested? Because plant root systems are not well developed, it is never recommended to harvest late summer-seeded alfalfa in the fall of the establishment year. Even with a large amount of top growth, alfalfa will not smother itself out during winter. Stands of late summer seeded alfalfa can be treated similar to an established stand during the first production year. Research at Iowa State University has shown that total-season forage yield in the first production year is slightly lower for late summer seeded alfalfa as compared to spring seeded alfalfa when cut at the same stage of maturity and frequency. Stand persistence was good when late summer seeded alfalfa stands were cut at the mid-vegetative to early bud stage during first cut and subsequent harvests are were delayed until early flower.